Metal chisels of robust construction with long wooden handles used for wood turning. A long and sturdy wood turning tool. I have only dabbled at wood turning but one of my old mates was an ace. He told me it was the most therapeutic pastime ever. He used to sell his turnings at a local craft market and had modest success. The trick according to Keith was to start off with a small set of turning tools that won't break the bank and learn to turn. 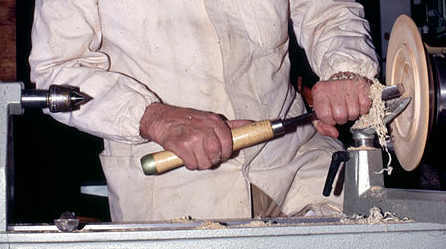 Get the basics off pat, then to buy just odd top quality chisel or two and turn your own handles. Longer and stronger than the ones you can buy. I can remember once seeing a guy turning a really large (like 8" dia. by 7ft long) piece of hardwood. He used a chisel that would have been at least 14" long with a handle that was about 3ft. long tucked firmly under his arm. Boy did he make it look easy! Tools for the job I guess. Of course it is always depending on the job in hand. 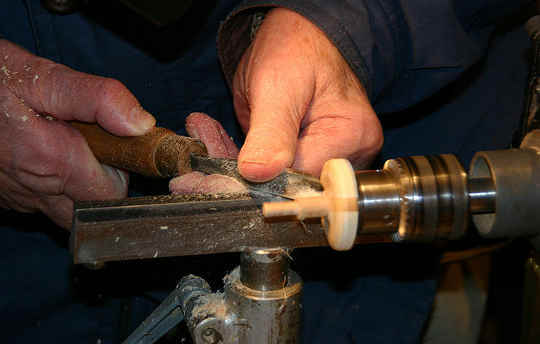 It would be pointless using a large tool on the delicate turning above. By the same token, If you buy a set of standard sized tools then don't go turning huge pieces. The size of the tool is related to how much you are wanting to take off. 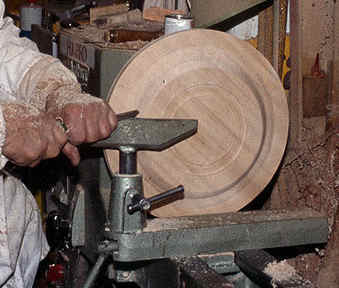 I have no doubt that the guy in the photo above used a larger tool to do the roughing out and is now using something smaller to start the finishing. The photos on this page are a bit short on the details of the actual tool types, sorry for that. One thing that they do show though is the correct use of the tool rest. It should be close to the work surface. If it is too far away then it may be hard to stop the material grabbing the chisel and causing damage or worse. Se the wood lathe page for more details.